In 1985, Brett Sperry and Louis Castle started a company in a suburban garage in Las Vegas. At first they named the company Brelous Software, but this was quickly changed to Westwood Associates. The early years were filled with contract work, porting games to different systems. Their very first title was the Temple of Apshai Trilogy port for the Macintosh in 1985, followed by ports for the Amiga and Atari ST the next year. In 1986, Westwood partnered with Strategic Simulations, Inc. (SSI), which published many of their early original games like Roadwar 2000 (1986) and Mars Saga (1988). The first notable games by Westwood were Dungeons & Dragons-based RPG games such as DragonStrike (1990) and Eye of the Beholder (1991), as well as BattleTech: The Crescent Hawks' Revenge (1990). 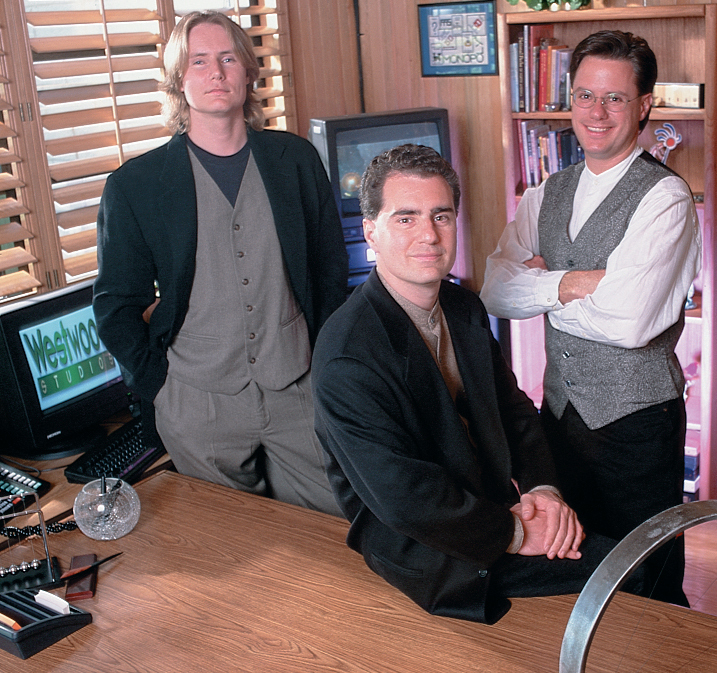 As Westwood grew in quality and staff, Sperry and Castle received many offers for a full buyout of the company from notable publishers of the time: Sierra On-Line and Virgin Games. They eventually chose Virgin Games despite Sierra giving a higher offer, as Virgin had promised more freedom and autonomy. After the deal with Virgin was finalized, Westwood Associates was renamed to Westwood Studios, making Westwood a subsidiary of Virgin Games while getting access to Virgin’s large marketing and distribution network, and could make use of intellectual properties they owned. 1992 featured the release of one of Westwood's landmark titles: Dune 2: The Building of Dynasty. Dune II is a real-time strategy game that introduced many of the features that games in the genre use to this day, such as resource harvesting, shroud (non-regrowing fog of war), unit construction, mission briefings, base building and more. Another notable game from the same year was the point-and-click adventure game The Legend of Kyrandia. In 1993, Westwood released The Legend of Kyrandia: Hand of Fate, Young Merlin, and Lands of Lore: The Throne of Chaos. 1994 saw the releases of The Legend of Kyrandia: Malcolm’s Revenge and The Lion King. On September 26th 1995 Westwood released Command & Conquer (C&C). C&C was a landmark title that helped popularize the real-time strategy genre. In the same year, Virgin Games renamed themselves to Virgin Interactive Entertainment (VIE) to emphasize their development of other interactive software. In 1996 Westwood released Command & Conquer: Red Alert, originally intended to be the prequel to Command & Conquer, and was well received for singleplayer and multiplayer alike. In 1997, Westwood released Blade Runner, a point-and-click adventure game set in prior to the film of the same name, featuring many branching paths in the storyline. They also released two expansions for Red Alert: CounterStrike and The Aftermath, as well as the short-lived online game Command & Conquer: Sole Survivor. By 1998, VIE was facing financial difficulties and was forced to put some of its assets for sale. On 17 August 1998, Electronic Arts acquired VIE's US assets for $122.5 million, Westwood Studios included. One other development studio owned by VIE, located in Irvine, California, was renamed Westwood Pacific after EA’s acquisition. Shortly thereafter, Westwood released Command & Conquer: Red Alert – Retaliation and Dune 2000, the latter being outsourced to Intelligent Games. By the end of the year, Westwood would release Golden Nugget 64 and Sports Car GT. In the late summer of 1999, after many development issues and delays, many of which were made in the final development year, Command & Conquer: Tiberian Sun was released. Its expansion pack, Firestorm, was released in March 2000. Also released in 1999 were Lands of Lore III and Recoil (latter helped by Zipper Interactive, who would make MechWarrior 3 in the same engine). Meanwhile, Westwood Pacific was working on a Diablo-styled RPG called Nox, and released it in February 2000. It was later expanded with a free expansion, Nox Quest. By early 2000, development had already begun on Command & Conquer: Red Alert 2, the first Command & Conquer game not to be developed by the original team at Las Vegas, although certain staff like the ones from art and audio departments moved back and forth between the studios. After a successful release in October 2000 and critical acclaim, October 2001 saw the release of its expansion pack, Yuri's Revenge. In 2001, a proper sequel to Dune II and Dune 2000 was released – Emperor: Battle for Dune, also outsourced to Intelligent Games. While it featured full 3D graphics, a continuation of the storyline, and new art style, it was not in the spotlight for long. The original team in Las Vegas was working heavily on Command & Conquer: Renegade, a first-/third-person shooter set during the events of the original Command & Conquer, and the project is known to have been in development as early as July 1997. It was the first game to use Westwood’s proprietary W3D engine, but was delayed and reimagined several times, being released in February 2002 to lukewarm response. While its singleplayer was not received well, it was most noted for its unique multiplayer mode. In the early 2000s, Westwood’s Las Vegas staff was stretched across several different projects, only three of which were released: the aforementioned C&C: Renegade, Pirates: Legend of the Black Kat (2002) and MMO Earth & Beyond (2002). The latter performed poorly, and was one of the reasons why Electronic Arts shut down the main studio in Las Vegas in early 2003. Official Earth & Beyond servers were shut down in 2004. Meanwhile, by 2002, Westwood Pacific was rebranded as EA Pacific, and released Command & Conquer: Generals in February 2003 as the first C&C RTS game in the SAGE engine, a modification of the W3D engine previously seen in Renegade. Its popularity matched that of Red Alert 2, and received an expansion pack, Zero Hour, by the end of the year. In early 2003, during the procedure of Westwood’s closure, the studio’s assets were shuffled. Electronic Arts Pacific, formerly a division of Westwood, was moved and repurposed as the RTS team of Electronic Arts Los Angeles, formerly known as DreamWorks Interactive, developers of The Neverhood and the Medal of Honor series. The studio was given reigns over the Command & Conquer intellectual property and technology, and staff from the Las Vegas studio was invited to join EALA if they so desired. Some accepted, while a fraction refused to do so. Joe Bostic, Mike Legg and Steve Tall formed Petroglyph Games on 1 April 2003. Electronic Arts Los Angeles’ RTS team would first create C&C: Generals - Zero Hour, after which they used the same engine to create the Battle for Middle-earth series (2004-2006), and after that, further Command & Conquer titles (2007-2010). Today, Westwood Studios' staff is scattered across the industry or is no longer active. While a few are still at Petroglyph Games, some are found at Blizzard Entertainment, others at Electronic Arts still, and some like Brett Sperry, Rade Stojsavljević and Adam Isgreen were at the short-lived Jet Set Games studio which aimed at the mobile market. In 2015, Brett Sperry and Louis Castle received the Industry Icon award at The Game Awards in the name of Westwood Studios.